I don’t think I’ve ever been this busy during the month of December and this year, I spent most of it longing to be in bed. Bronchitis will set a person back like that. I did however manage to get a couple of important projects taken care of. Unfortunately, none of them involved beading. Geek and I got married! He asked me to marry him on the Friday after Thanksgiving. I was pretty happy. We found a fabulous woman to perform the ceremony. She came to our home and we were married in front of the Christmas tree in the presence of our children. Our littlest one, rolled around on the floor with my flowers and baa’ed like a sheep. It was very family centered and was just perfect for us. Our only complaint of the day was that our cheeks hurt from smiling so much. The Christmas party? Well, that was to let everyone know that we got hitched. I spent the first week of December getting everything ready for our wedding. We decked out the house, hung lights outside and I spent hours and hours making garlands and wreaths to hang around the house. The second week was spent prepping for our party. Then we went to the farm for a family visit. At some point I became overwhelmed with Bronchitis. It’s been dreadfully uncomfortable but I think I’m finally on the upswing. I went in to the allergy clinic for my shot today and it was pointed out to me that I am allergic to trees, that it might not have been a good idea to sit among piles of tree boughs while making garlands, and that my recovery might actually happen faster if we remove all of the greenery from our home. About thirty seconds after I told geek this, he was in the family room ripping ornaments off of the trees and tossing wreaths. So Christmas is officially over in our house. 🙁 It’s such a shame because this was the best our home has ever looked during the holidays. I should have taken photos. Aside from sprucing up the house, I was able to make two special gifts. I knitted my son a scarf, and I crocheted a pair of fingerless gloves for my daughter. I also received a very special gift in the mail. My mom mailed me some of the ornaments off of our family tree. I remember fighting over them with my brother and sister over who got to hang what. I believe my mom made the felt ornaments in the 70’s. The others aren’t quite as old, I think we acquired them in the 80’s. It was such a surprise to open the box and find them. I cried a little. My family is so very far away and those silly little ornaments made me feel like they were here. Thanks mom! The trip to the farm was exhausting. It’s been forever since we’ve been down and I was just sick as a dog. I was also very behind on prepping for Christmas. I’m going to be honest and say that I wanted nothing more than to curl up on the couch, watch Christmas movies and have the kids bring me tea and a never ending supply of nyquil. Instead I spent several hours in the car clutching an empty dutch brother’s cup, hoping the hydrocodone cough syrup didn’t make me lose my dinner on the winding road. Despite all of that I am so glad that we made the trip. You know that song, the one that goes. “over the river and thru the woods, to grandmother’s house we go”.. Well that was us. It was dark when we left and it’s a three hour drive so it wasn’t any surprise that it was dark when we crossed the mountain pass. It was dead silent though and there was a dusting of snow on the evergreens that lined the road. We were the only car on the road and it seemed almost magical. The road that winds along the river, and thru the woods was a bit hairier. It sees very little traffic. There were trees down and a bit of snow to boot. I was very happy when we arrived. I didn’t venture out with geek and the kids but I hear they had a blast. They watched Salmon jump up the waterfall and hiked up in the woods a bit. I curled up on the couch with some tea, enjoyed the wood stove and worked on a scarf. The company was good. We got to catch up with extended family and the kids got to visit with friends too. I’d have liked to have stayed longer, but I knew I was already struggling to get caught up for Christmas. Sadly it was a short trip. Christmas was wonderful though. I still haven’t finished my Christmas cards, wedding announcements, home made granola or those hazelnut meringues I was going to make, but I was surrounded by people I love. Really when it comes down to it, that’s all that really matters isn’t it? I hope that you had a very happy Christmas and that the New Year brings you wondrous new possibilities. Thank you so much for stopping by! I’d love to see what everyone is making! I’ve got a few projects in the works. I did finish one of the earrings that I was working on. 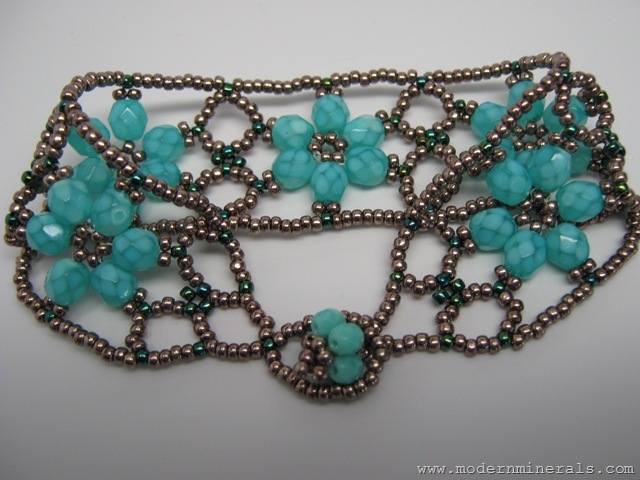 It’s very pretty (and easy to make when you use the right beads). I doubt that I’d wear it though so I’ve decided not to make the matched set. 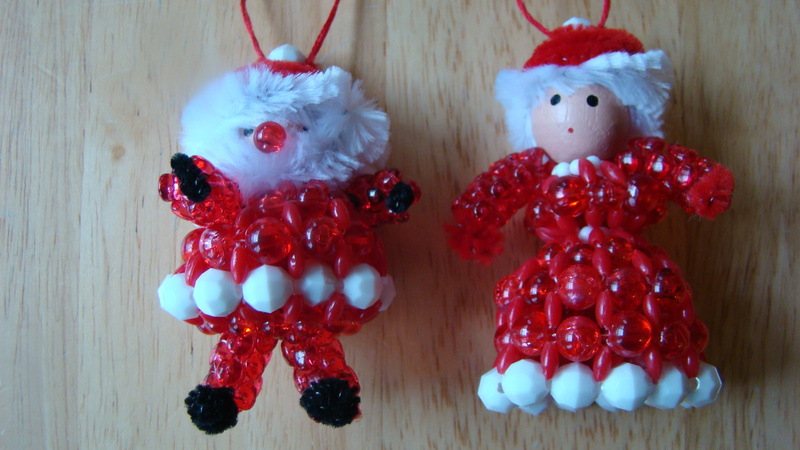 I’m determined to make my vintage, beaded Santa ornament this year and I’ve gotten some earring requests. Unfortunately I’ve not done much beading in the last few weeks. I’ve been crazy busy working on something very dear to my heart. I should be able to tell you all about it in just over a week. In the mean time, we are prepping for a (hopefully) large Christmas party. We’re going to give a “white elephant” exchange a go. They’re supposed to be a lot of fun. I’d love some gift suggestions! I’m also in the middle of a sock knitting class. So when I do have a few minutes I’ve been picking up some knitting needles. Working with four needles has been a bit challenging, but it’s been nice to give something new a go. This weekend however, is all about garlands and Christmas cards. 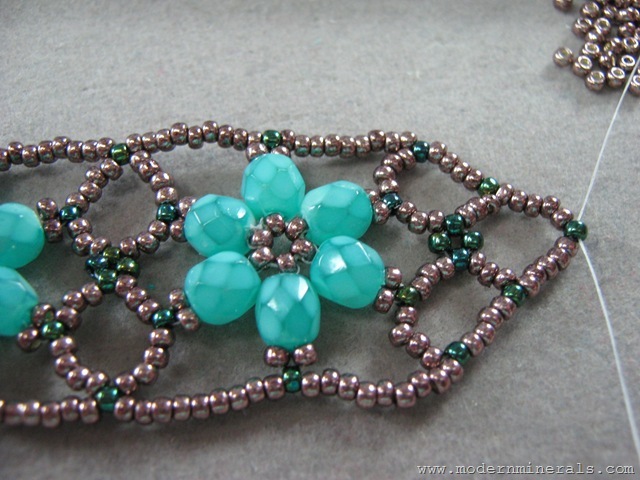 By now you should have the flower portion of the clasp done you should also have 5 pretty little flowers assembled. From this point on all you will need are the two different colored size 11 seed beads, two needles and some thread. I used fire line. I like to make sure I have enough thread so I cut my thread to be about 7 or 8 times the length of the bracelet and I had plenty left over. Step 1:You want to have a needle on each end of the thread. 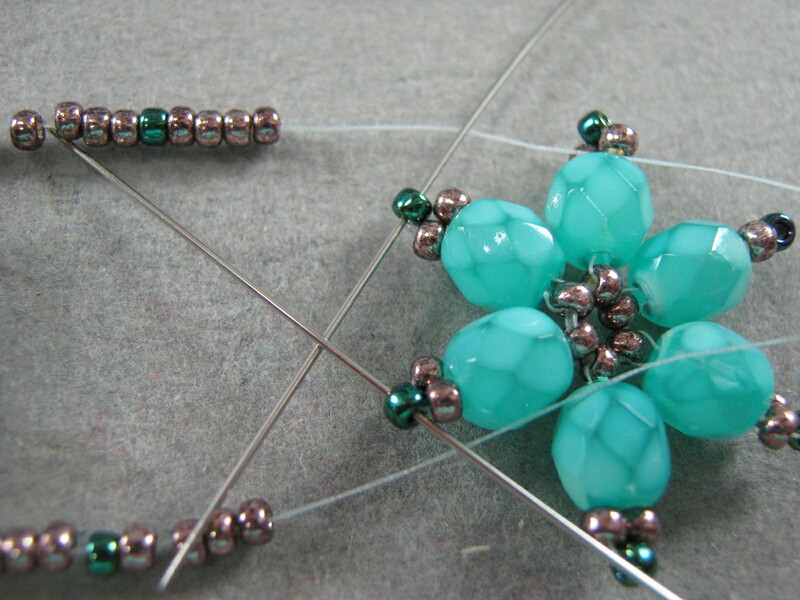 String on 3 brown seed beads and pass both needles through the center of the flower. Center the flower so that it is in the middle of the thread and both lengths of thread are roughly the same length. 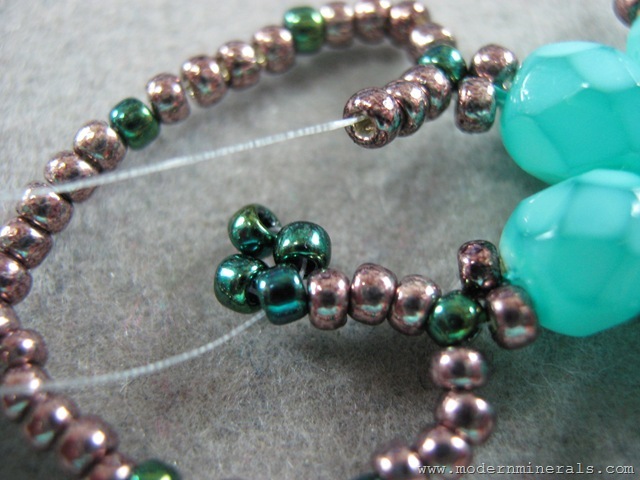 Step 2: String 1 brown bead on each of the two threads, then cross both thread through a third seed bead, just as you did in this post. Then thread on 5 brown beads, 1 green seed bead, 4 brown seed beads,1 green seed bead and then 4 more brown seed beads on to BOTH threads. Step 3: In this step you will attach the first flower. You want to take both needles and pick up two adjacent petals on the flower. 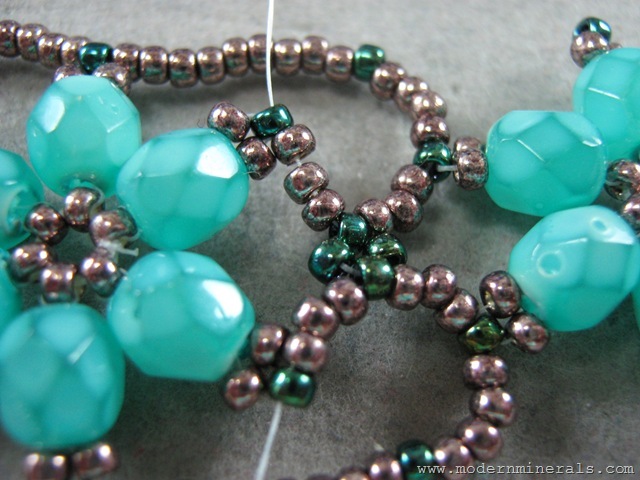 Thread the needle through the green seed bead. Direction matters. Thread the needles towards each other. Snug everything up the best you can. 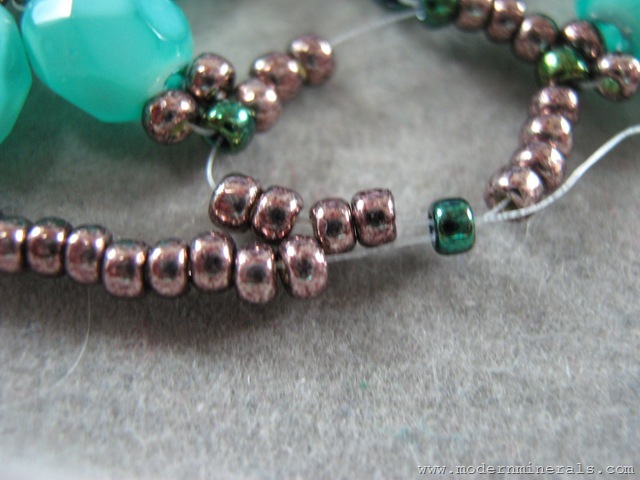 Step 4: Add 3 brown seed beads to each of the two threads. 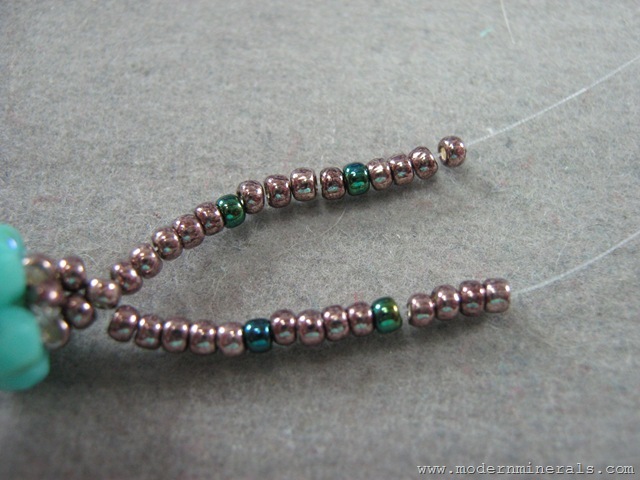 Then add (to one thread) 4 green seed beads. 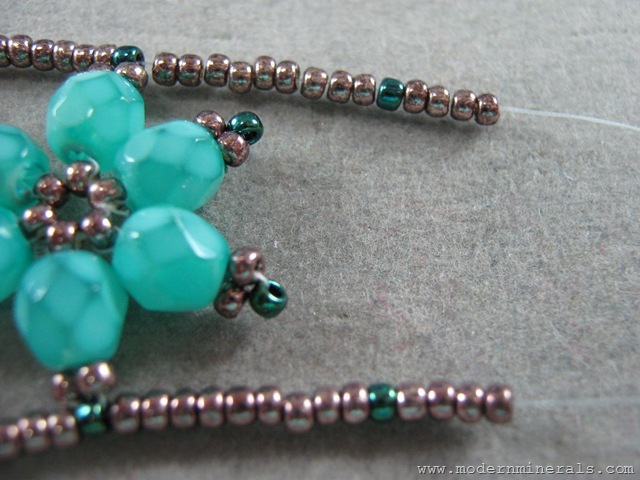 Take the needle back around and pass it back through the first green seed bead that you added and snug it up. You want to slide the little circle of beads all the way down to that is sits up against the 3 brown seed beads. 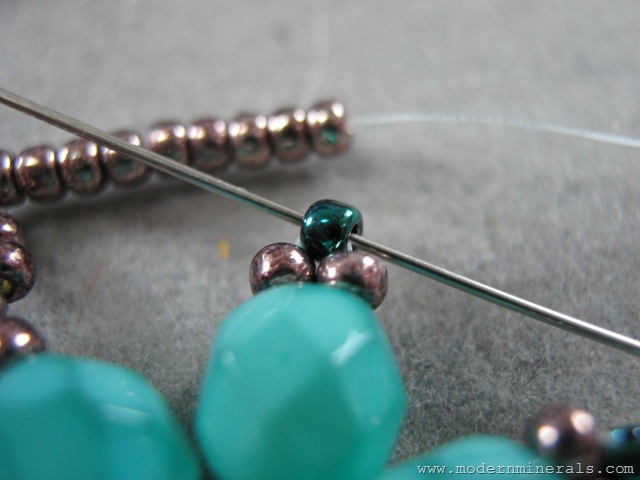 Step 5: Set down the thread that you strung the 4 green seed beads and pick up the other thread. 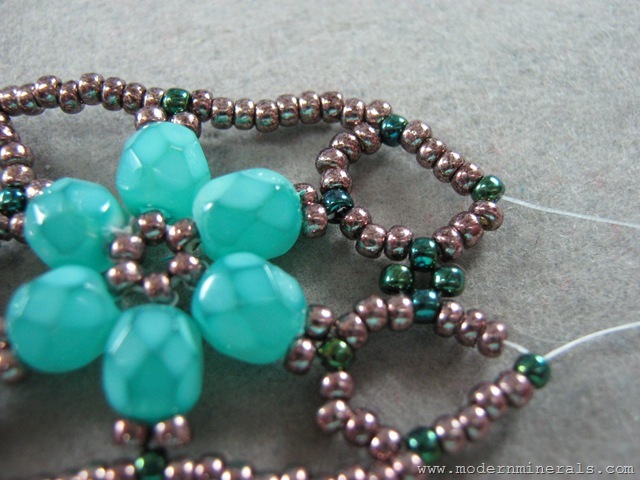 Pass the needle through the third green seed bead and then snug it up. Step 6: In this step you are making a pretzel. Thread 3 brown seed beads on to each thread. 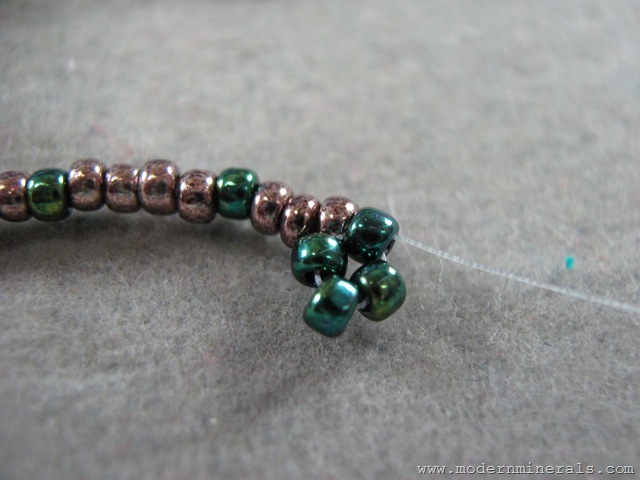 You will be using one thread to work down each side of the bracelet, so you don’t want to cross over to the other side. 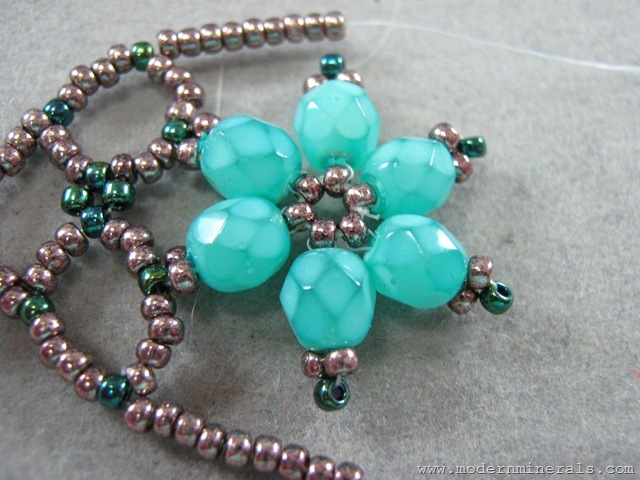 Once you have your three seed beads on, take the needle and pick up the first green seed bead that you added after you passed both thread through the flower clasp. 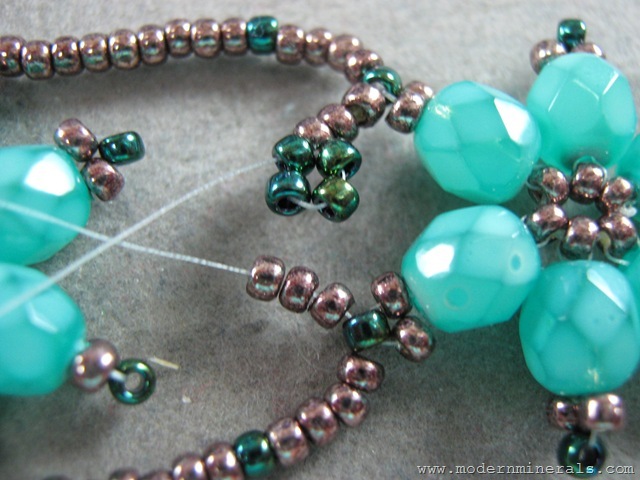 Run it through the four brown seed beads and out the other side of the next green seed bead. Do this to both sides. (best to do it one side at a time). Snug everything up. Step 7: Then add 9 brown seed beads to each thread. Step 8: Pick up the next petal by running the needle though the green seed bead going from left to right. Do this to both sides of the bracelet. (my photo is a bit misleading, it looks like I am going from right to left due to the way my thread is wrapped around…make sure you go from left to right!) Snug everything up. 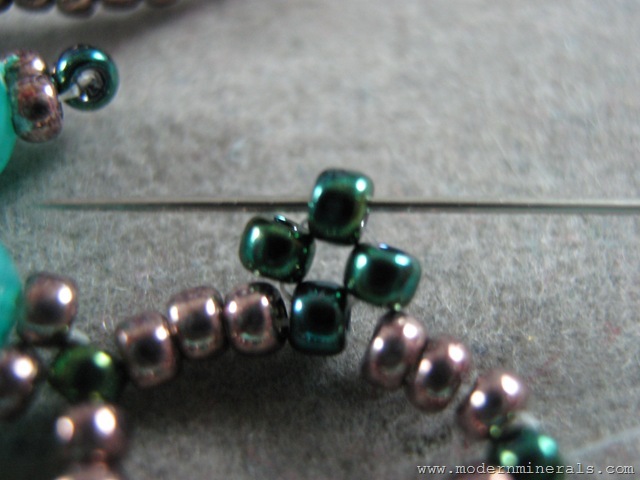 Step 9: Add 9 brown seed beads, 1 green seed bead and 4 more brown seed beads to each of the threads. It is from this point that you will repeat the steps until you have added all of the flowers. Step 10: You are going to add the next flower in the same way that you added the first one. 🙂 You will pick it up by the green seed beads on two adjacent petals, working the needles towards each other. Step 11: This next step is also done the same way. 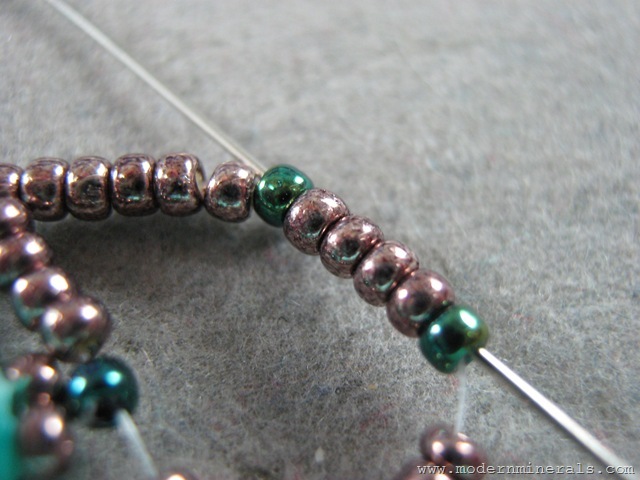 Add 3 brown seed beads to each of the two threads. 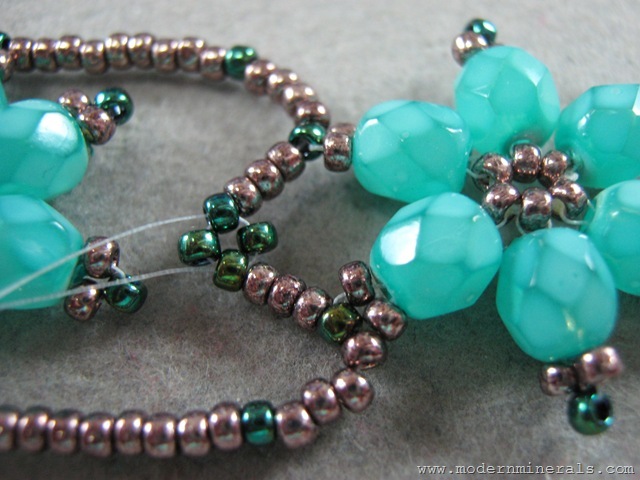 Then add (to one thread) 4 green seed beads. 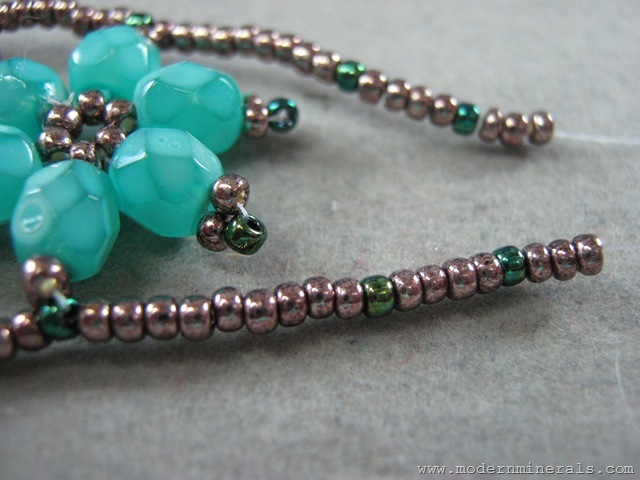 Take the needle back around and pass it back through the first green seed bead that you added and snug it up. You want to slide the little circle of beads all the way down to that is sits up against the 3 brown seed beads. 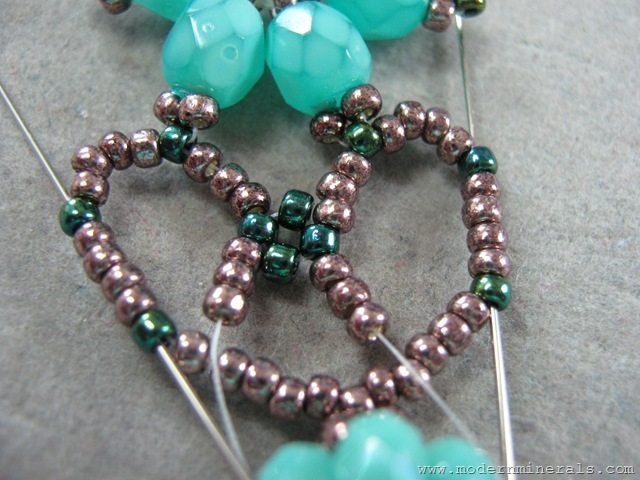 Step 12: Set down the thread that you strung the 4 green seed beads and pick up the other thread. Pass the needle through the third green seed bead and then snug it up. 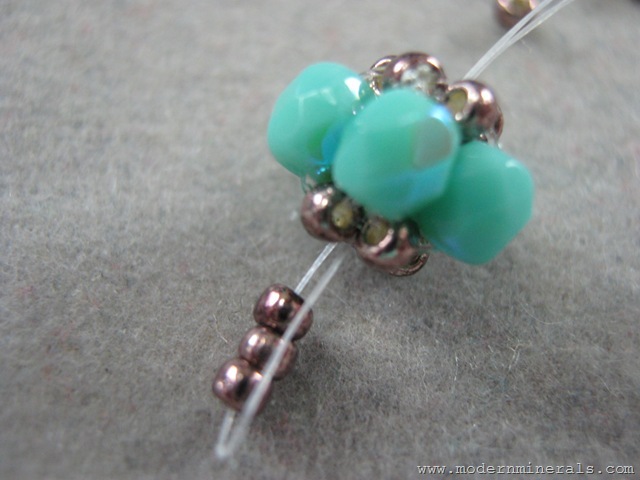 Step 13: Add 3 brown seed beads to each of the threads, then pick up the last two free petals (on the flower to the left) Thread the needle through the green seed beads moving in the direction of the center of the bracelet towards the outer edge. As always, make sure you do it to both sides! 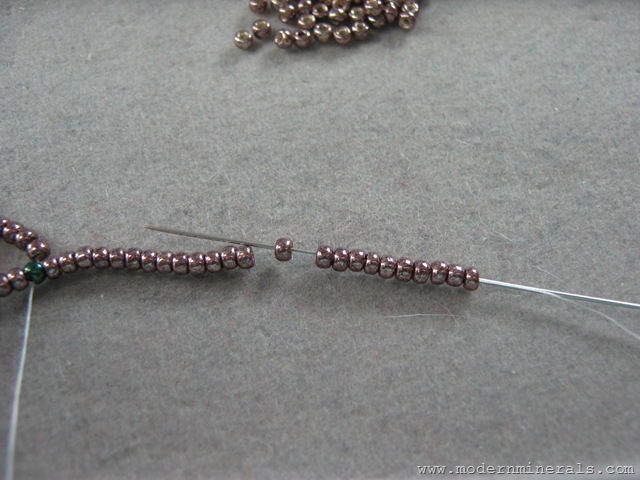 Step 14: Add 4 brown seed beads to each of the threads. 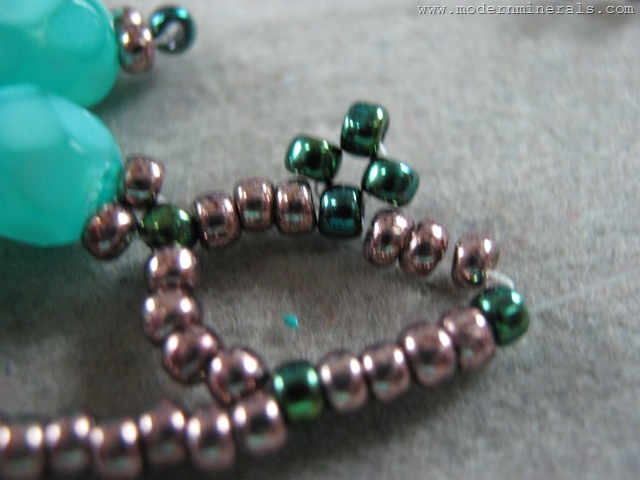 You are going to pick up the green seed bead that you added in Step 9. Then add 9 more brown seed beads and pick up the top and bottom petals of the last flower you added by running the needle through the green seed bead. Pass the needles through the bead from the left to the right. Snug everything up. l you have added all of the flowers. Once you have gotten the hang of this, it goes pretty quickly! Now we need to finish off the bracelet. To each thread you want to add: 9 brown seed beads, 1 green seed bead, 4 brown seed beads, 1 more green seed bead and then 3 more brown seed beads. 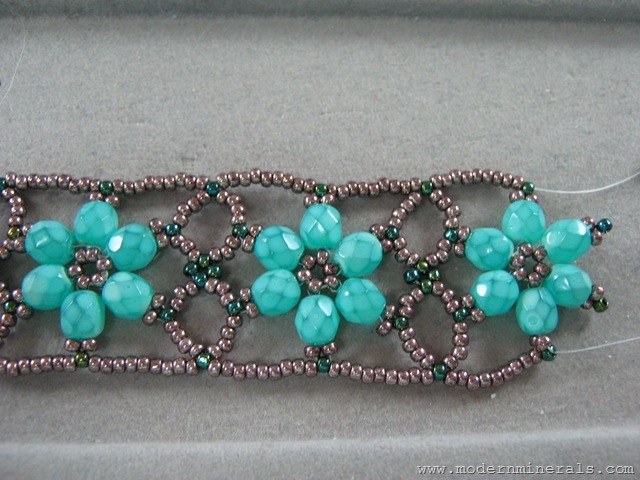 To one of those threads ( I chose the bottom one) you want to add 4 green seed beads. Take the needle and pass it back through the first green seed bead you added and snug everything up. Add 3 more brown seed beads and then pick up the appropriate petal. I’m working with the bottom thread, so that would be the bottom right petal on the last flower. 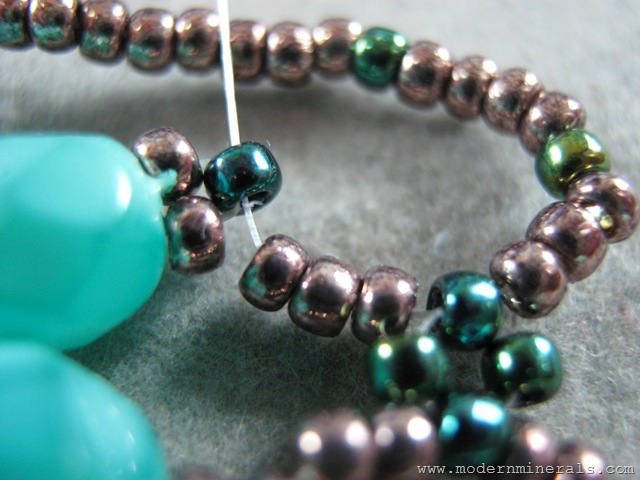 Pass the needle from the center of the bracelet to the outer edge. Add 4 more brown seed beads. 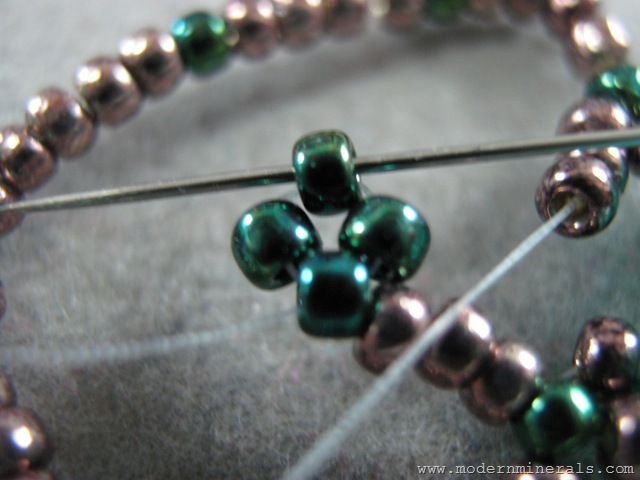 Then take the needle and pass it through the green seed bead, 4 brown seed beads and out the next green seed bead. (We are making the pretzel again.) Snug everything up. Set that thread aside and pick up the other one. You want to pass it through the third green seed bead in that little circle, just as you did when you were adding the flowers. Snug everything up. 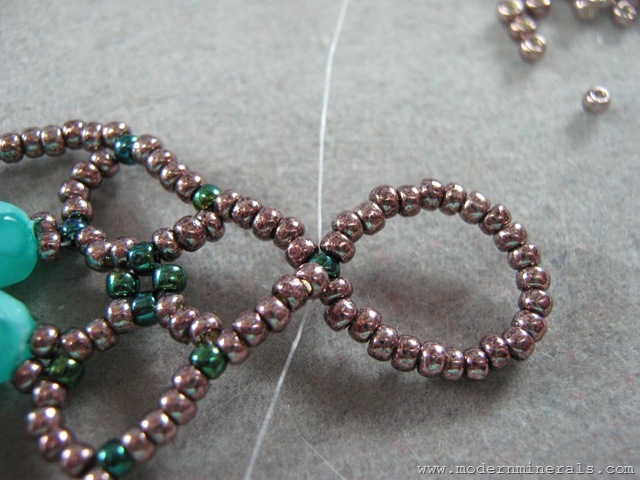 Add 3 more brown seed beads and then run the needle from green seed bead to green seed bead in the outer edge of the pretzel. Pull to snug everything up. 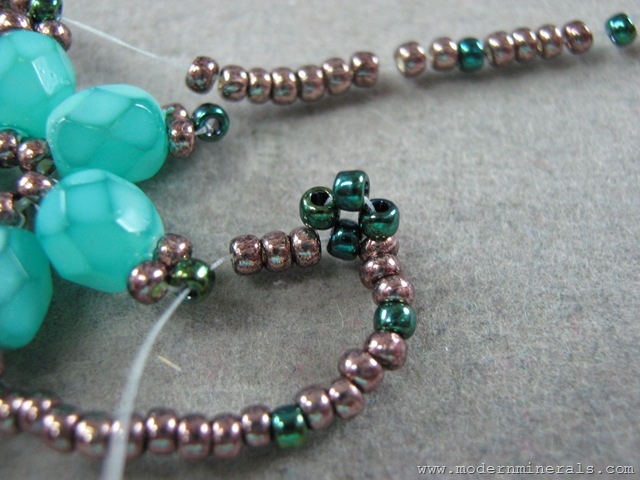 Add 5 brown seed beads to each thread and then pass both threads through 1 green seed bead. Snug everything up! You are going to pass both of the needles back through that last green seed bead going in opposite directions. When you snug everything up you will have a nice little loop of beads. Before working the threads back in to the piece and tying them off, I highly recommend that you try the bracelet on (carefully) and see if you like the size of the loop. I ran my thread back down in to the pretzel. I tied the thread together near the center green loop of beads. Then I wove both thread to an outer edge so that they crossed again and I finished it off. As usual, I daubed mine with a little bit of clear nail polish.